In a video address Wednesday afternoon, designed perhaps as a way to grab some of the spotlight after President Obama’s State of the Union Address dominated the attention of the country’s media, Republican National Committee chairman Reince Priebus said the GOP has been “grossly misunderstood” when it comes to its views on women and women’s issues. The video appears to be part of a new, aggressive outreach program on the part of Republicans to woo female voters, a contingent they have been woefully unsuccessful at winning over in recent elections. After a week in which former Arkansas Governor Mike Huckabee took fire for his comments about Democrats assuming women can’t control their libidos, Priebus sought to address a misconception about Republicans on that front as well — the front of women’s bodies. On the issue of abortion, Priebus did not attempt to deny the Republican Party’s opposition to its legality and practice. 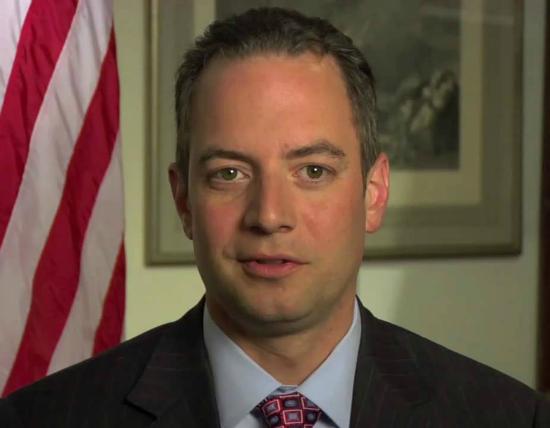 Priebus continued on the subject of abortion. Finally, Priebus had some choice words on another hot-button issue of the moment, contraception. Preibus ended the address with a simple question. What Else Has Dinesh D’Souza Done?